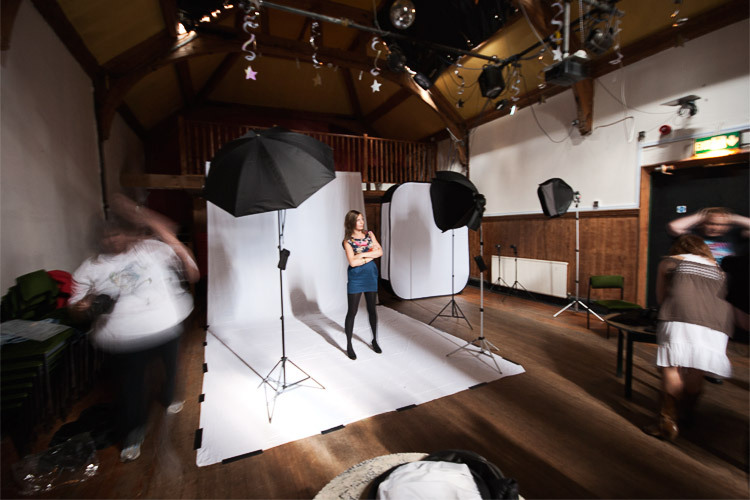 Last week I had the pleasure of teaching a flash portrait workshop to some of the members of Lancaster Photographic Society. I’ve not done much in the way of teaching in the past, except one-on-one when I’ve had assistants with me on a shoot, never in front of a class of several people simultaneously. I found that it can be rather distressing, even before the big day itself. The photographers in attendance were a mix of people ranging from those with a keen eye, eager to start breaking out of automatic settings, to those who possess a complete understanding of their camera and its capabilities but had yet to make the leap into using flash to enhance their imagery. Given the range of experience of the students, it was quite a task to figure out where exactly to begin, and how basic to make “the basics”, but the feedback I was getting throughout the day was very positive, and everybody went home with a lot more knowledge than they had when they arrived that morning; Which was fortunate, as that had been my plan. I want to extend a big thank you to the attendees from Lancaster Photographic Society for being such a pleasure to work with, Graham Binns for his assistance on the day and dealing with my stress beforehand and, finally, our lovely model, Sarah Christian.